Traffic along a section of the 3rd Ring Road in Beijing in May. 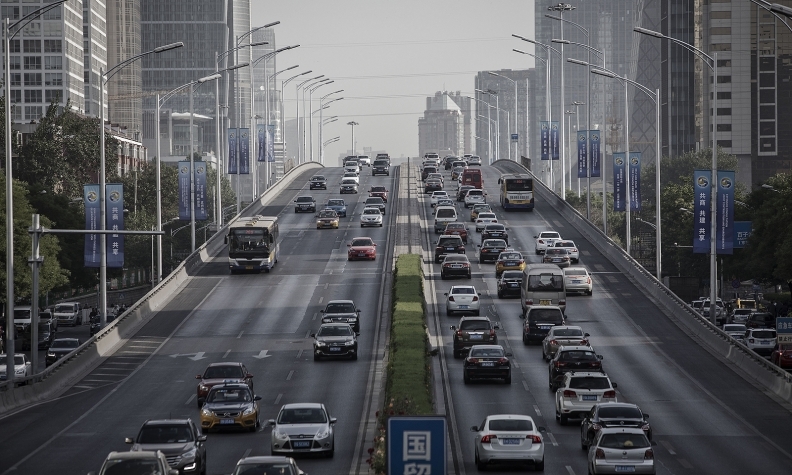 China, seeking to meet a pledge to cap carbon emissions by 2030, is the latest country to unveil plans to phase out vehicles running on fossil fuels. China is studying whether to set a deadline for automakers to end sales of fossil-fuel powered vehicles, a move aimed at pushing companies to speed efforts in developing electric vehicles for the world's biggest auto market. Xin Guobin, the vice minister of industry and information technology, said the government is working with other regulators on a timetable to end production and sales. The move would have a profound impact on the environment and growth of China's auto industry, Xin said at an auto forum in Tianjin on Saturday. A ban on combustion-engine vehicles will help push both local and global automakers to shift toward EVs, a carrot-and-stick approach that could boost sales of energy-efficient cars and trucks and reduce air pollution while serving the strategic goal of cutting oil imports. The government offers generous subsidies to makers of new-energy vehicles. It also plans to require automakers to earn enough credits or buy them from competitors with a surplus under a new cap-and-trade program for fuel economy and emissions. Honda will launch an electric car for the China market in 2018, China COO Yasuhide Mizuno said at the same forum. The Japanese carmaker is developing the vehicle with Chinese joint ventures of Guangqi Honda Automobile and Dongfeng Honda Automobile and will create a new brand with them, he said. Internet entrepreneur William Li's Nio will start selling ES8, a crossover powered only with batteries, in mid-December. The startup is working with state-owned Anhui Jianghuai Automobile Group, which also is in a venture with Volkswagen to introduce an electric SUV next year. China, seeking to meet its promise to cap its carbon emissions by 2030, is the latest country to unveil plans to phase out vehicles running on fossil fuels. The UK said in July it will ban sales of diesel- and gasoline-fueled cars by 2040, two weeks after France announced a similar plan to reduce air pollution and meet targets to keep global warming below 3.6 degrees Fahrenheit.